Do you know the correct way to help yourself to butter, mustard, jam, and similar accompaniments that are meant to shared among the people at a table? Aunt Dandelion is frequently aghast at the lack of general knowledge about this simple yet important principle of dining etiquette. 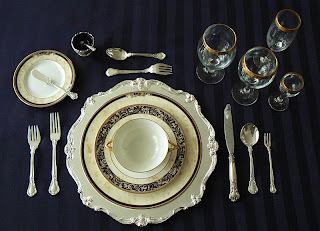 At table, you have your personal cutlery, which is set around your plate (see photo at the bottom of this post), and then there are serving pieces on the table such as butter knives, sugar spoons, and so on. The serving utensils are for everyone's use, so you must never use them to spread the condiment on your bread, meat, or whatever. Take the portion you need with the serving utensil, and daub or drop it on a clean part of your plate. Butter goes on the bread plate, mustard goes on the dinner plate, etc. NOT on your food. Immediately return the serving utensil to the communal dish and pass it to the diner on your left (always pass to the left). Use your personal knife, bread knife, or spoon, as appropriate, to spread or otherwise distribute the condiment on your own food. Break bread before buttering - use your fingers to break dry rolls and bread into bite-sized pieces and butter each piece just before you eat it, replacing your butter knife on the bread plate before taking the bite. Keep the serving utensil at your own place. This causes a problem for all the other diners. Stir your coffee or tea with the sugar serving spoon. Touch any part of a communal dish, food or server with your fingers or with a utensil that has been in your food or your mouth. Stab the butter knife into the top of the butter. Cut a slice from the end, and replace the knife to the side of the butter. Place a used utensil of any kind directly on the table or tablecloth. This is unsanitary and creates a mess that the hostess will have to clean up later. Try not to replace a serving utensil into the condiment itself. Replace it on the serving dish that should be underneath any condiment served in a bowl or jar. If your host has not thought of providing a small saucer or plate, you may have to replace the utensil directly in the condiment but this is unfortunate all around. Any questions? Ask Aunt Dandelion! All these utensils at your place are for your personal use. using one of your own personal utensils.